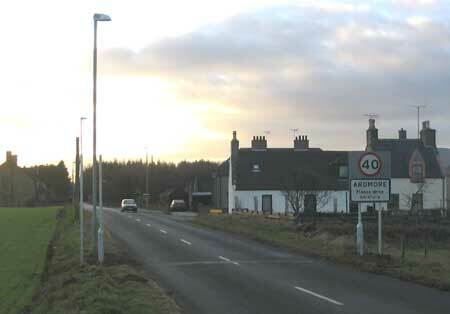 A considerable number of Kennethmont residents are currently enraged at Aberdeenshire Council in connection with new speed limit and place name signs being erected by them in the village. 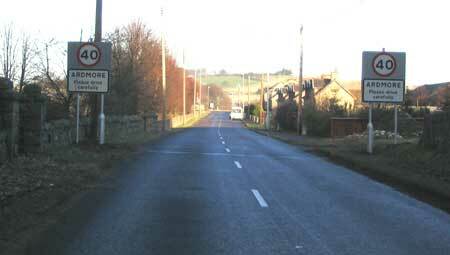 The speed limit at Kirkhill has been reduced to 30 mph with a new area of the main road reduced to 40mph at the station end of Kennethmont. 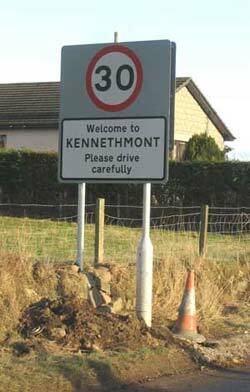 Kennethmont previously had two name signs, believed to have been erected post WW2 when wartime security measures were relaxed. One was located between Kirkhill and the Craighall road end, the other at the Station end on the Insch side of the former Temperence Hotel. The signs erected by the council appear to have been organised with very little thought, it may well be that whoever designed the new layout did not properly examine the locations involved, it may be that they were never here and did the work from behind a desk in Stonehaven. 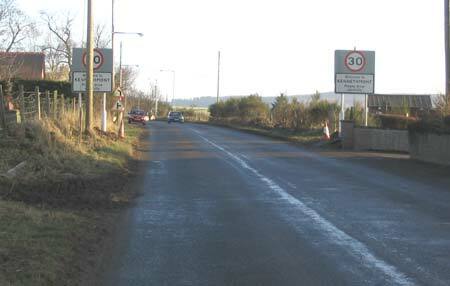 The signs approaching from Gartly have been erected with the posts on private land, with visibilty of / from a gate / entrance greatly obstructed. As can be seen from the above picture one of the signs is hidden behind an electric pole. The hamlet here is correctly, Kirkhill of Kennethmont. 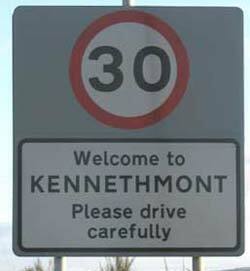 Regular visitors to this website will be aware it bears the name in it's original spelling - Kinnethmont. The sign at Kirkhill sited on a field dyke belonging to Leith Hall Estate. Unbelievable as it may seem, the Council have created a new hamlet at Kennethmont Station called Ardmore. No such place has ever existed in Aberdeenshire. 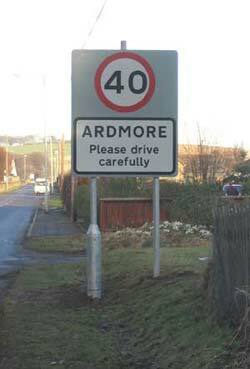 There are two Ardmores in Highland region and others in Ireland. Although there have been houses and commercial premises here since the railway arrived in the 1850's Ardmore Distillery opened in 1899. The name Ardmore is not a local one has never been used to describe the hamlet. The approach from Insch. The sign post on the left was actually located in a farmer's field. The farmer was in the process of replacing his fence when he discovered a sign had been erected in his park. The image above shows the posts after the left hand one was moved out of the park. It is understood that following site visits by Council staff and telephone calls to local Tap O' Noth Community Councilors they admit mistakes have been made and that a consultation process is now to take place. At a time when our Council tax is rising much more than inflation and the services we get for our money are disappearing fast it is a scandal that money is being wasted in this way by " experts " employed by the population. The Council are always complaining of lack of money, little wonder by this example. 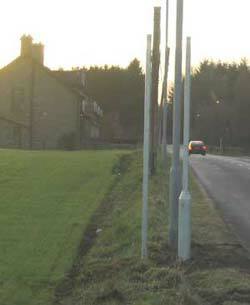 The Ardmore signs were eventually removed on 9th March.